I've almost always been a short haired girl. Although I begged to have hair long enough to put up in Princess Leia buns when I was in Kindergarten, my mother insisted my hair remain short enough that she could keep it combed and detangled with minimal effort. 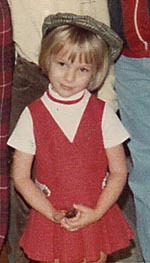 I got a lot of Dorothy Hamill haircuts and almost never had long enough hair to even manage a pony tail. 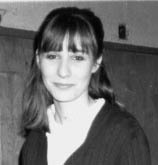 In high school, I briefly had long hair when I played Margot in The Diary of Anne Frank, but I got tired of it pretty quickly. In college, I grew my bangs out and the fastest way to get your bangs to match the length of your hair is to keep your hair cut short. I did eventually grow my hair out to a length where I could wear a pony tail, but I didn't like how it looked and chopped it all off again. Since then, it has stayed pretty short, until now. During my last pregnancy, I decided to grow it out. I was tired of short hair and ready for a change. I've had it trimmed a few times since then, but I'm enjoying the slightly long hair. The most unexpected thing for me is how much a certain spouse of mine likes my long hair. He never seemed to mind me with short hair, but when I last said I wanted my hair trimmed, he quickly replied, "Don't get too much taken off." What is it about long hair? Did I miss out on being a femme fatale and having a large male following in my single days by not having long hair? Do most of you men prefer a woman with longish hair? Or is it just my husband? It ain't just your husband. Long hair does frame the face differently, and it can make smooching sessions more interesting. My wife is looking forward to cutting our 3 y.o. duaghter's hair, now that the birth mother has had her rights almost officially terminated. She has very nice hair (straight with the last third curling naturally) but it's difficult to manage. You know that I generally prefer long hair. But funny thing, Husband doesn't really care either way. I always had short hair my whole life and grew it long when pg with David, and I loved having long hair, it was such a novelty. But Hubs never seemed to pay any attention to it, and that actually kind of bugged me. I wanted him to like it. Then I got it chopped a few years back to that very styled, layered look with the flipped up ends and he went GA-GA over it. It is the only time in my life he has ever made un-solicited comments about my hair. Of course, I've since grown it out and tend to keep it in the shoulder-length range, and once again, he never mentions it. But I like it better this way. For now. So do we get to see a picture??? It's her head, and she can do what she wants, but if the choice is mine, give me the longer tresses every time. Dan, obviously no wise and loving husband is going to say anything to his wife about her hair choices in anything less than positive and glowing tones. That would be like saying "Yes!" to the question, "Do these jeans make me look fat?" Wait, you can't tell us your hair is long-ish now without posting a picture!! We need to see!! No worries about jeans making you look fat when, of course, you're wearing Action Jeans. While a husband may use positive and glowing terms when describing his wife's hair, God forbid he should fail to notice and make a comment after his wife's triumphant return from the beauty salon. My DH loves long hair, he has told me this more then once.. BUT at the same time doesn't really care what I do with mine. Except he has told me to never go above my chin with it. LOL.. but I do know he likes it long, even if he didn't I like it long so I guess it doesn't matter LOL. Actually, Jordana, I decided long ago that the answer to "do I look fat?" is "yes." Because no matter how the question is phrased, it will always get rephrased a few times until I don't remember what the original question was. So to simplify life, I just get myself in trouble right away. I'm just saving time, that's all. I think it must be a guy thing ... the Husbandlet claims to prefer my hair long, though he always amends that with, "But you do what you want with it." I've been keeping it around shoulder-length of late, though, as the long hair, it annoys me after awhile. Cut the Squid's hair? NOT OK with the Husbandlet.